Rendering of the No. 2 Team Penske Ford to be driven by Brad Keselowski in the 2018 Southern 500 at Darlington Raceway on Sept. 2, 2018 (courtesy of Team Penske via Twitter). When the Monster Energy NASCAR Cup Series heads to Darlington (S.C.) Raceway for the Labor Day weekend running of the Southern 500 on Sept. 2, Brad Keselowski, driver of the No. 2 Team Penske Ford will honor a former driver of the Team Penske No. 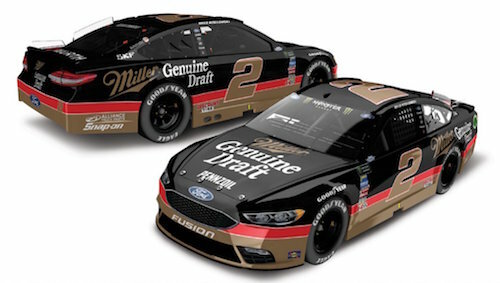 2, Rusty Wallace, with his throwback paint scheme, but Keselowski’s paint scheme for Darlington wasn’t inspired by one of Wallace’s No. 2 paint schemes. Instead, Keselowski’s No. 2 will carry a retro paint scheme inspired by the No. 27 Raymond Beadle-owned entry Wallace drove in 1990. “NEWS: It’s finally here! @Keselowski will run this No. 2 @Miller_Global paint scheme at @TooToughtoTame later this season. It’s a tribute to the 1990 design driven by @RustyWallace for car owner Raymond Beadle,” Team Penske (@Team_Penske) tweeted March 29. Wallace drove the No. 27 to two wins at Charlotte (N.C.) Motor Speedway and Sonoma (Calif.) Raceway in 1990, the season after claiming the Winston Cup championship. Wallace’s No. 27 was sponsored by Miller in 1990, just as Keselowski’s No. 2 is in 2018. Wallace moved to Team Penske to drive the No. 2 the following year, remaining there until his retirement at the end of the 2005 season. Keselowski’s paint scheme for Darlington is the second throwback paint scheme announced, so far, for the 2018 Southern 500. Stewart-Haas Racing already has revealed that Kurt Busch’s No. 41 Ford will look similar to the No. 97 Roush Fenway Racing Ford he drove in a 2003 race at Darlington in which he challenged Ricky Craven to one of NASCAR’s closest finishes. Craven claimed his second and final-career Cup Series win in that race.